In Woody Allen’s Crimes and Misdemeanors, Alan Alda’s sound bite ready TV executive argues that comedy is tragedy plus time before insensitively bungling an example of the less than well thought out point he was trying to make, which is that anything – including the Lincoln assassination – is fair game for hilarity since enough time has passed. Obviously, it’s an absolute disaster of a reference that in addition to cracking us up owes a lot to another pop culture truism which argues that you’re the sum of your tastes. And while Allen gets a lot of mileage out of it in revealing so much about a person (as well as the overall film) in just that one line, it also reminds you just how much humor and tragedy depend on one another in a symbiotic relationship to deliver the strongest and most identifiable characters and situations as captured onscreen. But perhaps no one was better at whipping up a realistic blend of comedy and tragedy than the immigrants turned filmmakers who first got their start in Hollywood in the pre-World War II era of the Great Depression from Lubitsch to Wilder. And while the proof of this goes back as far as the '30s, it was arguably Billy Wilder that aced the delicate combination of teary laughter to greatest effect during his '50s and '60s heyday. In fact, Billy Wilder’s audacity in launching funny side up into the most melancholic of situations with frequent muse Jack Lemmon in The Apaartment (and countless others) continues to inspire new generations of filmmakers to this day. And it was precisely this trademark Wilder sardonic wit blended together with the influence of the Gene Saks directed adaptation of Neil Simon’s timeless play The Odd Couple that encouraged comedic character actor Steve Coogan in his latest offering, which marks a great change of pace for the star. Inspired not only by the distinctly Wilderesque tone but the Odd Couple character driven plot device of two opposites who clashed their way into a friendship after seeing a sad article in The Guardian that was contrasted by a companion photo of the subjects laughing, Coogan bought the rights to the book from which the piece was derived without having read it. Based on a true story about Irish Catholic nuns that kept thousands of babies born to unwed mothers at their Abbey lodgings apart from the young girls who bore them, Philomena centers on one woman’s search for the son who’d been adopted away from her fifty years earlier. A horrific practice that as cinematically depicted is guaranteed to shock like no film since The Magdalene Sisters (which was also produced by daring arthouse champions the Weinstein brothers), this miscarriage of justice didn’t end until the 1990s and by that point so many records had been destroyed that for many all hope for a family reunion had been lost. Given the sensitive topic, Coogan is the first to admit that adapting the work allowed him to get out some of his own pent up anger at the hypocrisy of the church as a former Catholic school student (and as one in the same who likewise feels the same, this reviewer definitely felt a kinship with his take). Yet in adapting the book along with ITV fact-based production department head Jeff Pope, the two still show respect for and accurately represent the devout faith of the woman whose story they are bringing to life. 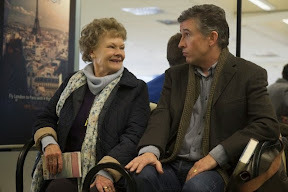 Although he’d initially intended to direct the film, when Coogan managed to land his first choice in actress Judi Dench (for whom he’d written the role), Coogan realized she needed a first class filmmaker worthier of the star. Likewise, he wanted someone who could make the most out of the tale that offered both Coogan and Dench an opportunity to explore their own background in casting that was decidedly against type. As such he turned to one of contemporary cinema’s greatest yet most frequently overlooked directors of actors in the form of Stephen Frears who’s spent a majority of his career guiding countless performers (and women in particular) to Oscar recognition. In that respect, you could almost go as far as to say that Frears is the UK’s version of Woody Allen, except for the fact that he doesn’t write his own scripts and instead uses that distance to his benefit in knowing what to keep and change. Attracted to the universality of the material which Coogan particularly liked because it offered the usually funny man something new to do, Philomena finds the actor in professionally similar terrain to the character he played when he first caught my attention via Michael Winterbottom’s 24 Hour Party People, which again was rooted in more character driven plotlines than multiplex-friendly gimmicks. Though he’s playing another journalist that’s likewise based on a real life individual, Coogan took artistic liberties to infuse his character Martin Sixsmith (who was barely in the book) with more of his own background. Crafting a hybrid of himself and Sixsmith, he’s helped set the stage for a personality based clash of manners and cultures among the leads when the snobbish, recently sacked BBC newsman grudgingly goes on the road with former nurse, Philomena (Dench). Barely able to hide his disenchantment, he nonetheless wants to milk all of the pain she’s been through for a killer personal interest story he hopes will put him back on top. Soon enough and against all odds, he finds himself getting caught up in the search for her son for real rather than the exploitative professional gain he’d hoped to get for penning a story he’d ordinarily never even read. 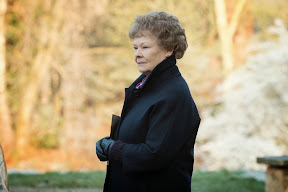 And when he begins to realize how much Philomena has been manipulated over the years, Martin’s previously professional instinct is usurped in favor of a desire to protect and help her get to the bottom of the heart-wrenching mystery as the originally cold, calculating Martin begins to gradually unthaw. Although initially his character is so unlikable that we’re not sure how we can get behind him, the fascinating premise and primal emotional pull of a mother separated from her child grabs us from the start. 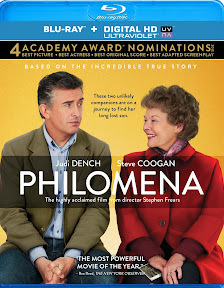 Admittedly contrived at times, Philomena nonetheless pushes back against any clichés and conveniences due to the undeniably moving performance of the Oscar nominated Dench in the Oscar nominated script that strikes a delicate, respectable balance of tragedy and comedy. Likewise, by surprisingly dealing out the comedy to Dench rather than Coogan and similarly putting his own male lead through the existential ringer helps make their characters that much more multifaceted and believable in the way everything is experienced with both humor and heart. 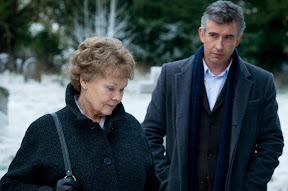 A terrific multi-generational tale of unlikely friendship disguised as an emotional family mystery, Philomena works very well on a number of different levels simultaneously. A film about the past that’s set in the present, Frears, Coogan and Pope were right to likewise venture to the past for their present day picture – paying homage to the Hollywood masters of yesteryear while incidentally doing the same in telling a tale that started fifty years earlier when Philomena was a teenager in Ireland and Billy Wilder’s The Apartment was most likely playing in Dublin.